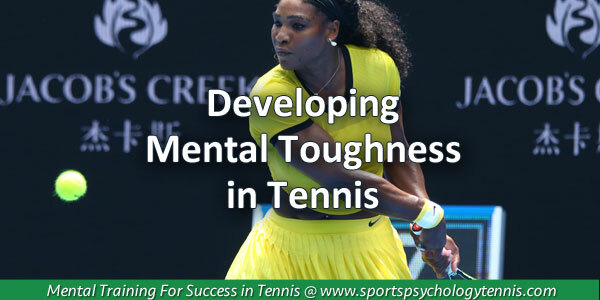 How Do You Improve Mental Toughness in Tennis? What does success in tennis require? Of course, success requires physical practice and technical skills but that is not enough. Tennis is more than being quick, having a strong aerobic capacity and having good strokes. Throughout the course of your tennis training and competitive career, you will have a lot of adversity. If you are not mentally tough, these challenges could hurt your play on the court and derail your career. Serena Williams is known for her accomplishments in tennis but also for her high level of mental toughness. Williams has dominated tennis for a long period of time. Serena has won 23 Grand Slam singles titles and has topped the rankings for 319 weeks. Some may point to her physical prowess, athleticism and powerful strokes for her success. Despite her success, Serena has overcome a lot throughout her career and attributes her success to mental toughness. Mental toughness is the hallmark of all great tennis players. When times get tough, the mentally tough get even tougher. Without mental toughness, you would not be able to fully take advantage of all your talents and abilities. Without mental toughness, you will not be able to surmount all the inevitable obstacles you will face throughout your tennis career. Not only does mental toughness help you overcome obstacles but it will help you deal with pressure, thrive during critical moments in matches, learn from losses and keep pushing forward when times get tough. Since tennis is highly competitive, you need an edge and the greatest advantage can be gained by honing your mental toughness. Best of all, mental toughness is available to every tennis player. How do you improve mental toughness? The short answer is that mental toughness is developed through training. Mental toughness training involves setting small challenges and finding ways to conquer those challenges. As you progress through those challenges, you can look to challenge yourself in more taxing ways. In essence, mental toughness is developed incrementally, similar to strength training. It does not happen overnight. Instead of looking for ways around obstacles, mental toughness training requires that you look for ways though obstacles by purposefully creating challenges in your practice and training sessions. Everything you do to improve your mental game will instill greater mental toughness. 1. Managing high expectations that undermine confidence. 2. Learn how to focus on the process instead of results. 3. Being proactive with your confidence and not leaving it to chance. 4. Learning how to take your training to matches. 5. Staying composed in challenging situations on the court. Boost Your Self-Confidence in Tennis With Expert Mental Game Coaching! Master mental game coach, Dr. Patrick Cohn, can help you overcome your mental game issues with personal mental game coaching. Call us toll free at 888-742-7225 (local: 407-909-1700) or contact us for more information about the different coaching programs we offer!